It's just been another one of those weeks, apart from the peg bag I haven't had time to do any sewing. I am just starting to back my yellow puffball today so hopefully I'll soon feel some sense of satisfaction! 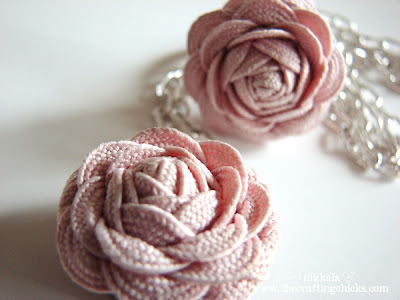 I have absolutely got to try to make these, very pretty. They could turn out to be a lovely gift for my nieces birthday in a couple of weeks! Have a look, there's a tutorial on the site. Half term next week so I doubt I'll be sewing at all, just enjoying having all my family at home! Let me know if you like the link or make the roses!